What follows are suggestions which could be used at different times in the Church Year. Much that follows merely gives proposals for choosing appropriate options from the Prayer Book's Liturgies of the Eucharist. The other suggestions conform to A Form for Ordering the Eucharist (pages 511514) and are thereby authorised for use. Examples below are also given in the hope that worship leaders will be encouraged to create and adapt other resources. We in New Zealand have an experience of December which is quite different to Europe. Here we too are waiting, but it is for the summer holidays, for examinations and their results, and for the end of the year. Images of reassessment, firstfruits, new birth and springtime link surprisingly well even with the readings of the Three Year Series designed in the Northern hemisphere. The Advent Wreath usually has four red or blue candles on a circle around a white or gold candle. The first candle is lit on the First Sunday in Advent, two on the Second, and so on until the central one is lit for Christmas. Liturgical Colour: Violet or preferably Blue to distinguish Advent from Lent. 1. The appropriate number of candles is lit on the Advent Wreath before the service begins. Alternatively, these candles are lit (by, for example, different children) during the Advent hymn. 2. Suggested greeting:	Grace and peace to you from God. God fill you with truth and joy. "Glory to God in the highest" is traditionally not used in Advent. If the Three Year Series is being used, "collects ... may be selected from any source" (page 691). Here follow three collects which pick up some Advent themes appropriate to New Zealand. These could, for example, be used on the Second, Third, and Fourth Sundays in Advent. Variation/Addition to the Great Thanksgiving: Advent. that all may welcome your Son at his coming. We ask this in the name of Jesus Emmanuel. Amen. New Zealand has a characteristic way of celebrating this our summer feast. Birth is all around us. There is newness and recreation. Families get together and there are summer holidays. It is these things, rather than the Northern winter, which need to be alluded to in our liturgies. Rather than seeing January 6 as beginning a new Epiphany Season, contemporary liturgy usually observes from December 25 through January 6 (or preferably the Sunday following) as a festival of the Incarnation and Manifestation. This period can be seen as the Christmas/Epiphany Season. It is usually a low period in New Zealand's church life. Christmas in New Zealand is celebrated more by anticipation in various special services leading up to Christmas Day. The Epiphany, although a Principal Feast in the Prayer Book, tends to be neglected when it falls on a weekday, and in that case it is better transferred to the Sunday before January 6. Liturgical Colour: White, Gold, or "best." We were walking in cold and darkness. Now we dwell in the warmth of your light. A child has been born for us, a new beginning is given to us. you bring us your peace. To highlight the note of Christmas celebration, it may be desirable to omit penitential elements in the Gathering of the Community. Alternatively, the following might replace a Prayer Book confession (for example, with all remaining standing after the greeting). These prayers are easily adapted, for example by replacing "In this holy night" by "On this holy day." God of darkness and silence, you have pierced the quiet of this night by the utterance of your Word in our flesh. May your word of compassion and reconciliation resound in us and through us. In this holy night angels proclaimed the peace of your unconquered Sun of righteousness. Strengthen all who work for peace and justice. In this holy night you came to us in a child cradled in a borrowed bed of straw as there was no room in the inn. Open our hearts to the needs of the homeless and the hungry. In this holy night shepherds and outcasts heard your good news. Give us grace to spread your gospel of joy and liberation. In this holy night we rejoice at the coming of this time of re creation. Be with those who travel, enrich our rejoicing, and strengthen the bonds between us. In this holy night Christians throughout the world are celebrating Christ's birth. Unite us in one family that we may shine with the one light that scatters all our darkness. In this holy night your living Word leaped down, shedding light on all who dwell in darkness and the shadow of death. Give strength and peace to all who suffer in body, mind, or spirit. In this holy night heaven and earth embrace and in your true child you give us power to be your children. Fulfil in your love all who have gone before us in the faith. May we, like them, remain faithful to the mystery of the Word made flesh and live in your eternal light. Hear these prayers we bring to you and fulfil your purposes in us in the name of Jesus, your incarnate Word. Amen. Variation/Addition to the Great Thanksgiving: Christmas. in this Eucharist we have celebrated your presence with us. who humbly shared our human life. and send us out to share this good news with others. We ask this through Jesus Christ Emmanuel. Ordinary Time extends from the Monday after the Baptism of the Lord through Shrove Tuesday; and from the Monday after the Day of Pentecost until the eve of Advent Sunday. 1. Suggested greeting:	The Lord be with you. and confess our failure to respond. and squandered our gifts and resources. and sought our own selfish pleasures. and embrace us when we turn to you. thirsty and we gave you nothing to drink. naked and we did not give you clothes. Jesus, you were sick and in prison and we did not visit you. in the Spirit of Jesus. In silence let us ask for forgiveness. forgive us, and bring us to fullness of life. Amen. in the words our Saviour gave us. you have given us a foretaste of your eternal banquet. Lent in this hemisphere heralds the autumn. Nature pares down to her essentials. She carries with her the seeds of the future. She concentrates her energies on the one thing necessary that life may be renewed when the globe turns once more towards the sun. Gardeners do their essential tidying and preparation. We plant our bulbs, hoping for new life in the future. We, the church, also pare down in Lent. Lent focuses on the essentials: the new life in the death and resurrection of Jesus and our participation in this through our faith and baptism. After the busyness of the summer there is a time to learn to pause. We Christians can plant some bulbs together, praying that through our celebration of Lent new life may spring up in our community and throughout the world. In modern liturgy the penitential flavour is now more concentrated on Ash Wednesday. Creation all around us is beginning to die. Nature seems to echo the ancient words addressed to each person at the imposition of ashes which marks the beginning of Lent: "Remember you are dust, and to dust you shall return." These forty days, approximately a tenth of the year, are our tithe of the year. Our personal Lenten disciplines, however, are not just another selfimprovement course. They are to prepare us for a party, the party of Easter. In a growing number of communities Lent is once again what it was in the early church, a special time of preparation for Easter baptisms or for a personal affirmation of one's baptism. As worshippers support these candidates, parents, sponsors, and companions, they are vividly reminded of their own baptism and encouraged to renew their baptismal commitment. The stark simplicity of Lenten worship can provide a striking contrast with the joyful celebration of Easter. Flowers might be absent from church, organ music restrained. Removing banners and pictures and veiling rich metalwork could enhance the atmosphere (though to obscure the cross in Lent seems to misunderstand the tradition, it may be better that a wooden cross replaces an expensive one). Traditionally, "Glory to God in the highest" is not used in Lent. Texts and hymns are carefully selected to avoid the use of the word "Alleluia" which is not used during Lent but will greet the resurrection on Easter Day. To grow closer to Christ we need to take time to reflect and pray. The danger of Lent is that it tends to be the church's busiest time as we add extra services and study on top of our full parish programme. In the gospel of the first Sunday of Lent we go with Jesus into his forty days in the desert (Three Year Series). Our times at church and the Lenten programmes can be oases in the desert, encouraging us on to that intimacy with God and a realistic examination of ourselves which the desert promises. Liturgical colour: Violet, or Lenten array (unbleached linen). With red during Holy Week. 1. Suggested greeting:	Grace and peace to you from God. Alternatively, the first hymn could be after the Confession and Absolution. Other penitential elements could be included (from, for example, the options on pages 405407). "Glory to God in the highest" is traditionally not used in Lent. Variation/Addition to the Great Thanksgiving: Lent, Passiontide (in Holy Week). This service is for Ash Wednesday. Where, because of particular circumstances, Ash Wednesday cannot be celebrated, this service may be used on the First Sunday in Lent. If ashes are used, they may be made from the palms of the previous Palm Sunday. These are often difficult to burn two minutes in a microwave (or the equivalent in a conventional oven) dries out the palms and helps them to burn well. All standing, the service begins with the following or another greeting. Let us (remain standing as we) pray (in silence) for grace to keep Lent faithfully. Psalm 51:117 (page 256f.) is used after the first reading. "Create in me a clean heart, O God." may be used by the congregation as a refrain after verse 2, 4a, 5, 7, 9, 11, 13, 15, and 17. Refrain: Create in me a clean heart, O God. in the fullness of your mercy blot out my offences. The Sermon may include an explanation of Lent and an invitation to keep it faithfully. Then all may stand. The presider may say these or other suitable words. E te whanau a te Karaiti/ Dear friends in Christ, every year we celebrate Christ's death and resurrection. Lent is a time to prepare for this celebration. In order that our Lent may be a time of renewal and growth we begin this season by remembering our need for repentance and for the forgiveness of God proclaimed by Jesus Christ. I invite you, therefore, in the name of Christ, to observe a holy Lent by selfexamination and repentance, by prayer, fasting, selfdenial, and giving to those in need, and by reading and meditating on the word of God. Either the Ten Commandments (page 521), with the response after each commandment, or the following litany of penitence may be used. We have not loved you with all our heart, and soul, and mind, and strength. We have been deaf to your call to serve. We have been unfaithful, proud, and hypocritical. We have been selfcentered, and have taken advantage of others. We have been envious of those more fortunate than ourselves. We have loved worldly goods and comforts too much. We have been dishonest in daily life and work. We have neglected prayer and worship, and have failed to commend the faith that is in us. We have been blind to human need and suffering, and indifferent to injustice and cruelty. We have thought uncharitably about others, and we have been prejudiced towards those who differ from us. We have wasted and polluted your creation, and lacked concern for those who come after us. Then the presider and people say together the following or another confession. and in the good we have not done. Those who desire to receive ashes come forward. The sign of the cross in ash is applied to the forehead of each person with any of the following or other suitable words. Two sentences may be used together, or imposition may be in silence. Repent and believe the Good News: God longs for you to be whole. Or ashes may be distributed in a question and answer form. Will you turn away from sin and be faithful to Christ? I will. During this time a psalm, hymn, or anthem may be used. pardon you and set you free. and keep you in life eternal. The Prayers of the People may follow. The Eucharist continues at the Peace. Variation/Addition to the Great Thanksgiving: Lent. Instead of the confession above, the presider can invite any who wish, to write on a slip of paper something for which they seek God's forgiveness and healing. The papers are collected and burnt as a symbol of God's forgiveness. A suitable, simple anthem or chant, for example from Taizé, may be used at this time. Palm Sunday is celebrated at the beginning of Holy Week. In the Three Year Series and the Revised Common Lectionary this, rather than the Fifth Sunday in Lent, is the Sunday of the Passion. Whenever possible the community gathers in a place apart from the church building, so that all may go into the church in procession. Palms or other branches to be carried in the procession may be brought by the congregation, be given to people as they arrive, or they may receive them after the prayer of blessing. The presider uses these or other appropriate words. E te whanau a te Karaiti/ Dear friends in Christ, during Lent we have been preparing for the celebration of Christ's death and resurrection. Today we come together to begin this solemn celebration in union with the church throughout the world. Christ entered Jerusalem this day in triumph, a triumph that led through suffering and death to resurrection and new life. In faith and love may we follow this messiah, the humble ruler, who comes riding on a donkey. Then one of the following is read. The presider then says the following blessing. God's Spirit is with us. for the acts of love by which you have set us free. and was greeted with branches of palm. symbols of martyrdom and majesty. with you and the Holy Spirit, now and for ever. Amen. Then may be said or sung. During the procession, all hold branches in their hands, and appropriate hymns, psalms (such as Psalm 118:1929), or anthems are sung. The Eucharist continues with the Collect of the Day, the readings and the Synoptic Passion account (page 699). The customary responses before and after the Gospel are omitted. Specific roles may be assigned to individuals and to the congregation. The congregation may be seated for the first part of the Passion. At the verse which mentions the arrival at Golgotha (Matthew 27:33; Mark 15:22; Luke 23:33) all stand. When the Liturgy of the Palms has begun this Eucharist, the creed and the confession are normally omitted. It is common for the bishop and clergy to gather on this day for the renewal of ordination vows and the blessing of the oils (pages 382, 746). Normally in the evening, the community gathers for the liturgy which is celebrated only once in the day. This is the beginning of the sacred three days of the celebration of the suffering, death and resurrection of Jesus Christ. In one sense our worship continues from now until the Easter celebration. There is no dismissal after this service, nor after the Good Friday celebration it is one continuous time of watching and celebrating the mystery of our salvation. This liturgy commemorates a) the institution of the Holy Eucharist at the last supper, b) the new commandment to love symbolised in the washing of feet, and c) the betrayal and beginning of Christ's passion and death. Sometimes this service has followed medieval and baroque practices of celebrating in a festive manner (with white vestments, Glory to God in the highest, and the ringing of bells). These notes follow a Passiontide style of celebration. The washing of feet has had a long association with the baptismal liturgy. Those to be baptised at Easter are beginning this feet first! Having one's feet washed is not restricted to baptism candidates, of course, but is open to all (women need to be warned beforehand about wearing tights). Servant God, on this night Jesus washed his disciples' feet: may we follow this example of love and service. God our companion, we pray for those unable to eat at the Lord's Table or at any other table, for those who betray and for those betrayed, and for all innocent victims. At the end of the service, the ornaments and cloths on the altar and in other places in the church building may be removed. During their removal, Matthew 26:3046 and Psalm 22 may be read. This service, which is normally celebrated in the afternoon, is a continuation of the Maundy Thursday liturgy and hence begins in silence as the night before ended in silence. Traditionally the holy table is completely bare until covered by a clean white cloth for the Ministry of the Sacrament. All hangings are removed. 1. The Ministry of the Word, with a focus on the Passion. 3. The Meditation on the Cross of Jesus. 4. The Ministry of the Sacrament. An alternative order could be 1,3,2,4 following the Ambrosian rite (which however had no communion). Having no communion on Good Friday is the most ancient tradition. In the early church, receiving communion would have been regarded as breaking the fast that lasted from Good Friday until the Easter Eucharist. Among the Orthodox, during Lent the Eucharist is celebrated on Saturdays, Sundays, and feast days. On other days the liturgy of the presanctified is celebrated (this is akin to receiving from the reserved Sacrament), but not on Good Friday, unless this falls on March 25, the feast of the Annunciation. From the time of the seventh century, the custom developed in the West of receiving communion (both bread and wine) from the Sacrament reserved after the Maundy Thursday Eucharist. Celebrating the Eucharist on Good Friday forms a third possibility. This follows the insight that the Eucharist is particularly a celebration and proclamation of Christ's death (1 Corinthians 11:26). Blessed be our God, for ever and ever. Refrain (after every two verses): My God, my God, why have you forsaken me? The Passion Gospel is announced in the following manner. The customary Gospel responses are omitted at the reading of the Passion. Roles may be assigned to different people and the congregation. The congregation may be seated until the verse which mentions the arrival at Golgotha (John 19:17) at which time all stand. A moment of silence is appropriately kept at Christ's death (after John 19:30). The term "the Jews" in St. John's Gospel applies to particular individuals rather than the whole Jewish people. Insofar as we ourselves turn against Christ, we are responsible for his death. The biddings which follow may be adapted as appropriate. The people may be directed to stand or kneel. The biddings may be read by a deacon or other person appointed. The presider says the collects. After each time of silence there may be a versicle and response such as, God of love grant our prayer. that God's love will comfort and sustain them, and that we may be stirred up to minister to them. in the joy of Christ's resurrection. The service may be concluded here with the singing of a hymn, the Lord's Prayer, and the concluding prayer below. My people, what wrong have I done to you? but you lead your Saviour to the cross. holy and just, have mercy upon us. I led you through the wilderness. and leave me thirsting upon a cross. but you give me a crown of thorns. but you raise me high upon a cross. sick and in prison, and you do not visit me. A hymn extolling the cross is sung. The service may be concluded here with the Lord's Prayer, and the concluding prayer below. In places where the Eucharist is to be celebrated, the service continues with the Preparation of the Gifts from any of the Eucharistic Liturgies. In places where Holy Communion is to be administered from the reserved Sacrament, the holy table having been covered with a clean white cloth, and the Sacrament having been brought and placed on the altar, the service may continue at the Communion in any of the Eucharistic Liturgies. The service may conclude with the following. No blessing or dismissal is added, and the ministers depart in silence. we ask this through Christ our Saviour. Amen. The Great Vigil of Easter, when observed, is the first service of Easter. It is celebrated at a convenient time between sunset on Holy Saturday and sunrise on Easter Morning. This, our autumn festival, celebrates a tomb burst open like ripened fruit. When the world turns towards its coldest and darkest, we Christians in New Zealand are among the first to proclaim that Christ, the light of the world, is risen. The fire heralds our winter, it is a welcoming beacon to church, the campfire of pilgrims around which we tell our stories, the hearth of our home. The Paschal Candle (like a pillar of fire) leads the pilgrim people into the dark church. The very ancient Exsultet is chanted by the deacon or other minister. Everyone can hold a candle lights from the light of Christ. 1. The Service of Light. 3. Baptism or the Renewal of Baptism. The order of the service may be 1234 or 2134. People can be encouraged to leave their watches at home and enjoy the celebration the party. If the Ministry of the Word (2) begins the service, the many readings, psalms, and prayers can with imagination form a longer vigil, with the readings (recounting our salvation history) interspersed with commentary, music, lengthy silences, drama, dance, singing, and audio visual presentations. Then in the dark, with the church lights out, "the new fire" may be kindled. In darkness, fire is kindled. The presider may then greet the people and address them in these or similar words. This is the passover of Jesus Christ. we celebrate the new life that Christ shares with us. The presider may say the following prayer. through every age for ever. Amen. (the last numeral in the lower right corner). illumine our hearts and minds. If candles have been distributed to the congregation, they are lit from the Paschal Candle at a convenient point during the procession. The Paschal Candle is placed in its stand. The deacon, or other person appointed, standing near the candle, sings or says the Exsultet. Let the heavenly chorus sing! Jesus Christ, our light, is risen! the light of Christ will warm our autumn night. Darkness will vanish for ever! Rejoice, O church of God! Exult in glory! and your Firstborn, our Saviour Jesus Christ. who at this feast has set your faithful people free. and led them through the Red Sea on dry land. brought light to your wandering people. and grow together in fullness of life. a pillar of fire that glows to your honour, O God. and continue burning to lighten the darkness of this night! May the Morning Star find this flame still burning among us. who rises to shed your peaceful light on all creation. Christ is now alive and glorified with you for ever and ever. After the Exsultet, handheld candles may be extinguished. Only those electric lights necessary for reasonable vision need be turned on. The Paschal Candle will burn at all services from now through the Day of Pentecost. The presider may introduce the readings with these or similar words. God sent Jesus Christ to be our redeemer. The following readings and psalms are provided from the Old Testament. A minimum of three is suggested. The reading from Exodus 14 is always used. After each reading, the psalm or canticle suggested, or some other suitable psalm, canticle, or hymn may be sung. A period of silence may be kept. An appropriate collect may be said. Four Old Testament readings, with examples of collects, are given here. by joyfully accepting your invitation to newness of life. We ask this through Jesus Christ, our Saviour. Amen. through Jesus Christ, our Saviour. Amen. Glory to God in the highest (page 405) or some other suitable song of praise is sung, all standing. Bells may be rung during this hymn. In some places it is the custom not to use the organ until this hymn. The altar candles may be lit at this point and any additional electric lights may be turned on. The following or another Collect of the Day is said prior to the epistle reading. A silence for reflection may follow. The Liturgy of Baptism and the Laying on of Hands for Confirmation and Renewal (page 383) may follow. If there are no candidates for this, the presider leads the people in the following. I invite you (to stand) to affirm your commitment to Christ and your rejection of all that is evil. Those who are baptised are called to worship and serve God. From the beginning, believers have continued in the apostles' teaching and fellowship, in the breaking of bread, and in the prayers. Will you commit yourself to this life? Will you forgive others as you are forgiven? Will you seek to love your neighbour as yourself, and strive for peace and justice? Will you accept the cost of following Jesus Christ in your daily life and work? With the whole Church will you proclaim by word and action the Good News of God in Christ? If water is to be used, the following thanksgiving for water is said. The water may be in the font or in a special vessel. The section between brackets may be omitted. to sustain, refresh and cleanse all life. you led them to freedom in the promised land. and anointed with the Holy Spirit. and raise us to new life. and share in your eternal kingdom. may continue for ever in the risen life of Christ. The congregation may be sprinkled. The renewal of baptism is concluded with the following prayer. The service continues with The Ministry of the Sacrament. Variation/Addition to the Great Thanksgiving: Easter. The risen Christ is in our midst, so with Christ we pray. Go now to love and serve the Lord. Go in peace. Alleluia! Alleluia! Amen. We go in the name of Christ. Alleluia! Alleluia! 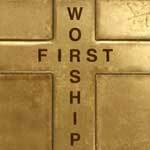 Renewal of worship has rediscovered the value and significance of the Easter Season. Easter is not just "Easter Day," it is the fifty days from Easter Day until the Day of Pentecost. During this season, Sundays might be better named "of Easter" rather than "after Easter" ("The Third Sunday after Easter," for example, is better termed "The Fourth Sunday of Easter"). These fifty days, a seventh of the year, form our great "Sunday" of the year. "Alleluia! Christ is risen. He is risen indeed. Alleluia!" forms the greeting in every service during Eastertide. Similarly "Alleluia! Alleluia!" is added to the Dismissal and the people's response (these are equivalent to the "Alleluia" added at the beginning and end of the Daily Services). These help to give these celebrations a distinctive festal feel. The Paschal Candle is lit at every service up to and including the Day of Pentecost. "Glory to God in the highest" may be used daily from Easter Day through the Day of Pentecost. Alternatively, some communities use it daily for the first week of Easter. Other appropriate Songs of Praise are given below. We in the southern hemisphere could make far more use of a Service of Light throughout the fifty days of Easter. Daily, or on certain days, people might gather in church in the evening, to light the Paschal Candle and sing the (at least sixteen centuries old) "Hail gladdening Light" (Phos Hilaron page 175) or another hymn. Thanksgiving for light may follow, incense may be used (Ps 141:2), and parts of Night Prayer, Evening Worship, or the Daily Services may be used. Such a Service of Light, appropriately simplified, can form a very attractive focus for family prayer or prayer in a housegroup. A Vigil service on the eve of the Day of Pentecost could focus around such a Service of Light. The Day of Pentecost concludes the Easter Season. Pentecost is our church's winter festival when we celebrate the sweeping of the Spirit of God over the darkness and over the face of the waters. The Jewish Pentecost was a single feastday celebrating harvest and commemorating the covenant. In the early church, however, the Christian Pentecost was not merely the "fiftieth day," but the word "Pentecost" often referred to the whole period of fifty days which began on Easter Day. This stress is being recovered. Now once more Eastertide is the "Season of Pentecost." The Day of Pentecost concludes the Pentecost season rather than beginning it. Just as Sunday is the first and the eighth day, so the "great Sunday" of the fifty days of Eastertide/Pentecost begins with the day of the resurrection and continues through eight Sundays, an octave of Sundays, a "week of weeks." It has been suggested that the English expression "Whitsunday" derives from the French huit (eight), Pentecost being le huitième dimanche, the eighth Sunday of Easter. In the Fourth Gospel the risen Christ imparts the gift of the Spirit on the evening of Easter Day (John 20:1923). The Spirit is the gift of the risen Christ. And so in the Easter Season, this "Pentecost Season," (particularly in the Three Year Series) we listen to the farewell discourses, with their promise of the coming Advocate, as words to us from the risen Christ. The Paschal Candle is lit at all services during the Easter Season. To highlight the Resurrection celebration and contrast vigorously with Lent, penitential elements are minimised or preferably omitted in the Gathering of the Community. 2. Easter Greeting:	Alleluia! Christ is risen. Sprinkling the community with baptismal water may appropriately follow a baptism. Alternatively sprinkling could be part of the Gathering of the Community. Variation/Addition to the Great Thanksgiving: Easter; Ascension (near Ascension Day); Pentecost (between Ascension Day and the Day of Pentecost). The Easter acclamations continue through to the evening of the Day of Pentecost. The Paschal Candle is lit at ordinary services for the last time on the Day of Pentecost. Thereafter it is moved from the sanctuary to the baptistery and is lit during baptisms and funerals (when it is usually moved near to the casket), reminding us that we are baptised into Christ's death and resurrection. Everyone carried a candle lit from the Paschal Candle during the Easter vigil, symbolically sharing the light of the risen Christ. Perhaps on the Day of Pentecost, during the period of reflection after receiving communion, these candles could be relit from the Paschal Candle. The Pentecostal fire is thereby visibly divided and shared by everyone (cf. Acts 2:14; first reading for the Day of Pentecost, Three Year Series). The Paschal Candle can then be extinguished, vividly concluding the Fifty Days. The risen and ascended Christ, gone from our sight, is still present by the Spirit and we are commissioned to go out into the world to spread the light of Christ. (This might be symbolised by all processing out with the lit candles). Water is also a rich symbol of the Spirit. Hence, sprinkling with water while singing a dynamic, vibrant song after the renewal of our baptism on the Day of Pentecost could also be very powerful. in songs of everlasting praise."